The portfolio contains nine buildings totaling 823,000 square feet throughout five cities, including a 124,000-square-foot building at 1601 Alton Parkway in Irvine. SAN DIEGO -- Rexford Industrial Realty has acquired a seven-property industrial portfolio in Southern California for $90 million. The portfolio contains nine buildings totaling 823,000 square feet throughout five cities. The acquisition includes: 5235 E. Hunter Ave. in Anaheim; 1601 Alton Parkway in Irvine; 3880 W. Valley Blvd. in Pomona; 14955-14971 Salt Lake Ave. in the City of Industry; and 9855 and 9755 Distribution Ave. and 9340, 9404 and 9455 Cabot Drive in San Diego. The portfolio is almost 90 percent leased. The seller was Westcore Properties. CBRE's Darla Longo, Barbara Emmons and Rebecca Perlmutter Finkel represented both parties in this transaction. "We've owned these properties for several years and executed business plans to lease up vacancies and drive revenue," says Don Ankeny, Westcore's president and CEO. "Coupled with interest in the Southern California industrial market, it was an ideal time to sell the portfolio and redeploy the capital in other value-add opportunities in the Western region." The first phase of I-80 Logistics Center will include two buildings of 305,760 square feet and 283,920 square feet. SALT LAKE CITY -- USAA Real Estate Co. plans to build a 590,000-square-foot logistics center in Salt Lake City. The dual distribution warehouses will be situated on 31 acres at the entrance to the master-planned Bonneville Center. The 480-acre Bonneville Center is located two miles west of Salt Lake City International Airport. The new Class A project is known as I-80 Logistics Center due to its close proximity to the interstate. The first phase of I-80 Logistics Center will include two buildings of 305,760 square feet and 283,920 square feet. Each building will be designed to accommodate up to six tenants. The properties can also be combined to accommodate a larger user that requires up to 650,000 square feet. Seefried Properties is co-developing the project. USAA originally acquired 57.4 acres near the Bonneville Center, 26.4 of which may be used to construct a third building with 502,320 square feet at a later date. "Situated midway between coasts and appointed with excellent infrastructure and transportation modes, Salt Lake City is a critical logistics hub, particularly for Western U.S. markets that are enjoying renewed economic growth," says Len O'Donnell, USAA's CEO. "Demand for large-format, Class A warehouse space is high and growing among leading national corporations." The historic office building is home to tech companies Zendesk and Zoosk, and to Blick Art Supplies, which occupies the ground-floor retail space. SAN FRANCISCO -- ASB Real Estate Investments has acquired a 111,497-square-foot creative office and retail property in San Francisco for $61.2 million. The six-story property is located at 989 Market St., near the intersection of Market and 6th streets in the city's Mid-Market corridor. The historic office building was originally constructed in 1908. It underwent extensive renovations from 2011 to 2013. It is now 94 percent occupied. Notable tenants include tech companies Zendesk and Zoosk, as well as Blick Art Supplies, which occupies the ground-floor retail space. HFF's Steven Golubchik, Nicholas Bicardo, John Simerlein, Nathan Blair, Mark Damiani and Josh DiSalle represented the seller, Harbert Management Corp., in the transaction. HFF had previously secured $27.7 million in financing for the seller in 2012. "Mid-Market is home to more than 20 percent of technology companies headquartered in San Francisco," Golubchik says. "With the renaissance occurring in the immediate areas, coupled with 989 Market proving to be a preferred creative building in the corridor, we saw a substantial amount of both domestic and international interest for the opportunity." The 384-unit Colter Park enjoys easy access to the Uptown/Midtown office corridor, Downtown Phoenix and the Biltmore area of the Camelback Corridor. PHOENIX -- A limited partnership formed by the Sheiner Group has acquired the 384-unit Colter Park apartment complex in Phoenix for an undisclosed sum. The community is located at 909 W. Colter St. near the Melrose District/7th Avenue/Camelback Valley Metro light rail station. The community was built in 1972. It also enjoys easy access to the Uptown/Midtown office corridor, downtown Phoenix and the Biltmore area of the Camelback Corridor. Steve Gebing of Institutional Property Advisors and Cliff David of Marcus & Millichap represented the seller, an institutional pension fund advisor. "Colter Park enjoys a commanding position in the City of Phoenix Infill Development District and within Transit-Oriented Zoning Overlay District One (TOD-1), an area that is experiencing a lifestyle regeneration through millions of dollars in gentrification efforts leading to unprecedented rental demand," Gebing says. "The property's seller implemented strategic capital expenditures to increase revenue and attract and retain an upgraded resident profile." Terra Vida is situated near Colorado State University, in addition to major employers like Agilent Technologies, HP, Intel, Poudre Valley Health Systems and Wolf Robotics. FORT COLLINS, COLO. -- Mountain View Capital has acquired the 240-unit Terra Vida apartment complex in Fort Collins for $39 million. The community is located at 3707 Precision Drive, just west of Interstate 25 near East Harmony Road. Terra Vida is situated near Colorado State University, in addition to major employers like Agilent Technologies, HP, Intel, Poudre Valley Health Systems and Wolf Robotics. The community was 96 percent occupied at the time of sale. It was built in 2012. Doug Andrews, Jeff Hawks, Terrance Hunt and Shane Ozment of ARA Colorado represented the sellers, Milestone Development Group LLC and partner Les Kaplan, in the transaction. "Terra Vida is the newest and most luxurious apartment community in Northern Colorado," says Hunt. "This property is strategically located to take advantage of the ongoing expansion of Harmony Road and the growing energy market in Northern Colorado." SANTA CLARA, CALIF. -- A 25,545-square-foot Sprouts Farmers Market has opened at the Santa Clara Town Centre. Sprouts is located at 2060 El Camino Real. Fellow tenants at the center include Target, Peet's Coffee & Tea, Panera Bread, Chipotle Mexican Grill, Peninsula Beauty Supply, Footwear, Etc., and The Habit Burger Grill. Bob Berndt and Sarah Edwards of SRS Real Estate Partners represented Sprouts in the lease transaction. Mike Messinger and David Taxin of Meacham/Oppenheimer CORFAC International represented the landlord, Byer Properties LP. Enterprise Rent-A-Car and Wasabi Sushi. LAKE FOREST, CALIF. -- Foothill Center, a 19,400-square-foot shopping center in the South Orange County submarket of Lake Forest, has sold to a China-based investor for $7.6 million. The non-anchored retail strip center is located at 20641-20671 Lake Forest Drive, just north of Interstate 5 and Highway 241. The center is 95 percent occupied. Notable tenants include Baja Fresh, Enterprise Rent-A-Car and Wasabi Sushi. The buyer represented itself in this transaction, while Matthew Mousavi and Patrick Luther of Faris Lee Investments represented the seller, The Mayfield Trust. "We positioned the property as a unique opportunity to acquire a self-contained strip center in a master-planned community with upside potential through property improvements and leasing up of the remaining space, as well as by bringing rents up to market rates as the current leases expire within the tenant base," says Mousavi. "Faris Lee conducted an extensive marketing campaign to target foreign investors, particularly the Asian investor. We have a proprietary database of Asian investors, brokers, asset managers, and other gatekeepers to this highly active buyer pool." Demand for office space nationwide accelerated in the second quarter of 2014, according to research reports by several commercial real estate services firms that track data throughout the United States. CBRE Group Inc. found that office vacancy rates declined in seven out of 13 major metro office markets during the second quarter of the year. The firm also reported that average asking rents increased during this period. In its quarterly report, CBRE found that Atlanta led in vacancy declines, with a vacancy rate drop of 60 basis points (bps) during the quarter. Chicago posted a fall of 50 bps in its office vacancy rate, and Seattle's rate dropped 30 bps due to the expansion in its office stock of high-tech occupiers. Increases in bps occurred in Boston (40 bps), Dallas and Washington, D.C. (both 30 bps). Vacancy rates in markets such as San Francisco and Houston are now near pre-recession levels. San Francisco saw a 3.7 percent increase in its average asking rents, and Houston experienced a 3.5 percent increase. 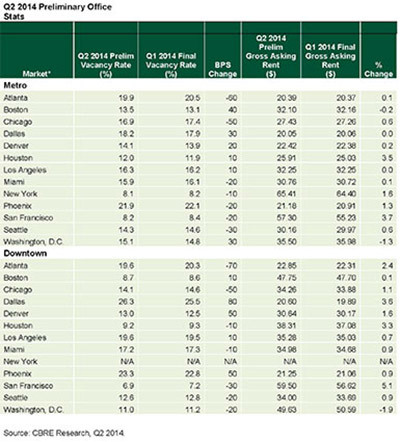 Boston and Washington, D.C., saw decreases in average asking rents -- 0.2 percent and 1.3 percent, respectively. Kevin Thorpe, chief economist of Cassidy Turley, says this growth was expected but his firm's findings pointed to stronger underlying trends. "The office sector was due for a stronger quarter following the weather disruptions [of the first quarter], but what is telling is that we are now observing stronger demand trends for Class B and C space in many markets, indicating tenant demand is spreading beyond the highest quality product. Although high-quality space still dominates leasing activity, the Class B and C segment of the market accounted for 40 percent of the absorption this quarter, a major shift from the 25 percent averaged earlier in the recovery."